Haverhill is located on I-495 in northeast Massachusetts, approx. 35 miles north of Boston. From Route 495 South: I-495 to Exit 50 (Rt. 97/Broadway). Turn left off exit, crossing Rt. 495. Turn left at the 1st traffic light (Monument Street). Proceed straight at 4-way stop. Take next right into high school parking lot. Go past the swim center and athletic fields to the rink. From Route 495 North: I-495 to Exit 50 (Rt. 97/Broadway). Proceed straight at traffic light at end of the exit (Monument Street). Proceed straight at 4-way stop. Take next right into high school parking lot. Go past the swim center and athletic fields to the rink. From Downtown Haverhill: Rt. 97 (Broadway) north. At fork, bear right on N. Broadway. Follow N. Broadway to the 4-way stop (Monument Street). Turn right on Monument St., then take the next right into the high school parking lot. 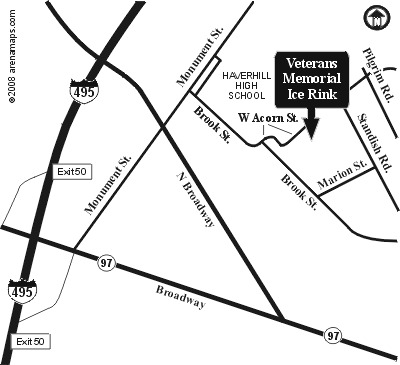 Go past the swim center and athletic fields to the rink.